Gianfranco Ferré, fall/winter 2001-02 collection: silver sequined top and mini skirt under a fur-trimmed leather coat. and Ferré couture collection, 2002; initial public offering planned, 2003. Exhibitions: Italian Re-Evolution, La Jolla Museum of Art, California, 1982; Intimate Architecture: Contemporary Clothing Design, Massachusetts Institute of Technology, Cambridge, 1982; Design Italian Society in the Eighties, La Jolla Museum of Contemporary Art, 1982; Creators of Italian Fashion 1920-80, Osaka and Tokyo, 1983; Il Genio Antipatico: Creativitá e tecnologia della Moda Italiana 1951-1983 ( The Unpleasant Genius: Creativity and Technology of Italian Fashion 1951-1983 ), Rome, 1984; Tartan: A Grand Celebration of the Tradition of Tartan, Fashion Institute of Technology, 1988; Momenti del design italiano nell'industria e nella moda, Seoul, 1990; Japonism in Fashion, National Museum of Modern Art, 1994. Awards: Tiberio d'Oro award, 1976; Best Stylist of the Year award by Asahi Shimbun and Women's Wear Daily, 1983; Modepreis for women's fashions, Monaco, 1985; Cutty Sark Men's Fashion award, New York, 1985; Medal of Civic Merit, Milan, 1985; named Commendatore dell'Ordine al Merito della Repubblica Italiana, 1986; Dé d'Or prize for first haute couture collection for Dior, 1989; named "Milanese of the Year" by the Famiglia Meneghina, 1989; I Grandi Protagonisti prize from the Italian Furs Association, 1990; Lorenzo il Magnifico award from the Medicean Academy, Florence, 1990; Occhio d'Oro prize, 1983, 1983/84, 1985, 1986/87, 1987/88, 1989; Il Fiorino d'Oro award, 1991; Pitti Immagine Uomo award, 1993. Address: Via della Spiga 19a, 20121 Milan, Italy. Lettres á un jeune couturier, Paris, 1995. "Le ragioni del sentimento," in L'Uomo Vogue (Milan), October 1987. Sartogo, Piero, ed., Italian Re-Evolution [exhibition catalogue], LaJolla, California, 1982. Alfonsi, Maria-Vittoria, Leaders in Fashion: I grandi personaggi della moda, Bologna, 1983. Giacomoni, Silvia, The Italian Look Reflected, Milan, 1984. Soli, Pia, ed., Il genio antipatico [exhibition catalogue], Milan, 1984. Aragno Giordani, ed., Moda Italia [exhibition catalogue], Milan,1988. Howell, Georgina, Sultans of Style: Thirty Years of Fashion and Passion 1960-90, London, 1990. ——, In Vogue, London, 1992. Ferri, Edgarda, Ferré, Milan, 1995. Ferré, Giusi, Gianfranco Ferré: Itinerario, Milan, 1998, 1999. Ferré, Giusi, and Samuele Mazza, Gianfranco Ferré, Corte Madera, CA, 1998. "The New Architectural Approach to Fashion," in Vogue, June 1982. "Gianfranco Ferré: Expanding His Research," in WWD, 5 April 1986. "Roma alta moda: Gianfranco Ferré," in Vogue (Milan), September 1987. Smith, Liz, "Architect of New Classics," in the Times (London), 8December 1987. "Gianfranco Ferré: Dá alla donna forma e slancio," in Vogue (Milan),January 1988. Howell, Georgina, "Gianfranco Ferré, the Nonconformist," in Vogue, July 1988. "Ferré and Gigli, Architects of Modern Style," in Elle (London),October 1988. "Gianfranco Ferré," in Donna (Milan), March 1989. Menkes, Suzy, "The Italian Connection," in the Sunday Express Magazine (London), 11 June 1989. Smith, Liz, "My Fair Ferré," in the Times (London), 25 July 1989. Baudet, François, "Gianfranco Ferré," in Vogue (Paris), August 1989. Menkes, Suzy, "Ferré Strikes Gold," in the Illustrated London News (London), Autumn 1989. Kleers, Paul, "Ferré in Focus," in GQ, March 1990. Mayle, Peter, "Ferré's a Jolly Good Fellow," in GQ, September 1990. Boriou, Gisella, "Gianfranco Ferré: I Am a Mix of Sensitivity and Concreteness," in Donna, November 1990. Forden, Sara Gay, "Frankly Ferré," in DNR, 21 June 1993. Aspesi, Natalia, "Le Donne di Ferre," in Il Venerdi' di Repubblica, April 1994. Carloni, Maria Vittoria, "Bello & Brutto: Lo Stile Secondo Ferré," in Panorama, June 1994. Blanchard, Tamsin, "New-Look Dior Fails to Suit 1990s Woman," in the Independent 11 October 1994. Forden, Sara Gay, "It's Time (Italian Fashion Designer Gianfranco Ferré)," in DNR, 31 January 1995. Spindler, Amy M., "Armani and Ferré: A Study in Contrast, in the New York Times, 11 March 1995. Forden, Sara Gay, "Ferré's New Jeans Line…," in DNR, 17 July 1996. Socha, Miles, "Ferré Plans Multitiered Line of Men's Accessories," in DNR, 6 September 1996. "Ferré Sets Up U.S. Division, Names a Head," in WWD, 5 June 1997. Forden, Sara Gay, "Gianfranco Ferré Joins Ranks of Designers with Itch for an IPO," in WWD, 15 September 1997. "Gianfranco Ferré," in WWD, 24 February 1998. Conti, Samantha, "Mattioli Sells Part of His Ferré Stake," in WWD, 23 December 1999. ——, "Ferré Tries His Hand at Sartorial Line," in DNR, 22 March 2000. ——, "GTP Acquires Ferré," in WWD, 22 December 2000. "Ferré New Owners Consider Stock Listing," in WWD, 15 March 2001. 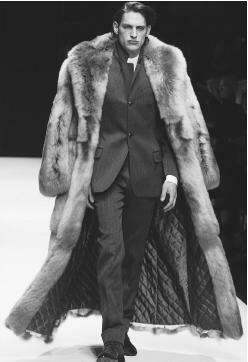 Gianfranco Ferré, fall/winter 2001-02 collection. languages, individualistic or mass behaviour and any other event which marks our society or determines its choices also determines trends or, at least, [change in] fashion. A fashion designer has to be an attentive interpreter of these events; has to be able to prophecy, without forgetting the realities of industry and commerce. My role as a fashion designer comes from a complex process, where creativity and imagination play an important role, but are supported by a firm rational analysis. Gianfranco Ferré has been dubbed by Women's Wear Daily as the "Frank Lloyd Wright of Italian Fashion." Trained initially as an architect, his work bears many references to this early discipline. He draws up a plan for each collection based on a philosophy that his customer wants functional, classic yet powerful clothes, constructed in the highest quality materials. The clothes are then created with a distinct eye for dramatic proportion and purity of line. There is nothing understated about Ferré womenswear. His minimalist approach has often made opulent, theatrical statements on the catwalk, recalling the film star glamor projected by Anita Ekberg in the film La Dolce Vita. The clothes reflect a glamorous, fantasy dressing, combined with architectural symmetry. Ferré often exaggerates proportions in tailoring and dressmaking; classic shirt shapes often have extreme cuffs or collars, coats and jackets are defined by silhouette. An extravagant use of luxury fabrics like fur on dresses or long evening coats, leather, and taffeta often in the distinctive, stark colors of red, black, white or gold reinforce this definition of modern elegance. Ferré menswear collections are less extravagant, based on tradition but designed with his characteristic modernist approach. He sees his customer as a man who appreciates traditional cloth and a classic line. Ferré has developed new tailoring techniques to create a more relaxed, expansive shape for men, a reaction to the hard-edged lines so prevalent in 1980s power dressing. Ferré often looks to London for inspiration, believing the British capital is a key point in the world of fashion. As he explained to journalist Liz Smith, "There is an in-bred eccentricity in London which allows clothes to be worn in original and completely modern proportions." Ferré has a reputation for being a realist, with a practical approach to projects—working with everything in his head from market requirements, manufacturing schedules, financial limitations, and development of themes, to advertising. Brought up in a secure family environment, his mother instilled him with an obsessive sense of duty and responsibility; she was strict when it came to homework and passing exams. This level-headed approach even caused him to react with economic sense to Diana Vreeland's famous fashion quote, "Pink is the navy blue of India," made during the course of a conversation with Ferré. He replied judiciously, "Naturally pink is the navy blue of India because it's the cheapest of all dyes." In 1989 Ferré was appointed designer for Dior, to supply the house with an image for the 1990s. His first collection introduced a refined, sober, and strict collection inspired by Cecil Beaton's black-and-white Ascot scene from the film My Fair Lady, a theme revisited in 1996 with the launch of a men's jeans collection. The new Ferré Jeans line, all in black and white, came in casual separates of three styles— basic, athletic, and beach wear. Ferré commented to Sara Gay Forden of the Daily News Record (17 July 1996), "This is not your standard, classic jeans line… This is a forward-looking collection for the future generation." Ferré further forged ahead in 1996 with the debut of the Gieffeffe unisex fragrance, along with the Gieffeffe bridge collection priced to battle DKNY and Calvin Klein's CK for the hearts and dollars of hipster youth. The first Gieffeffe store opened as well, in Florence, Italy, with a second shop planned for Milan in 1997 and several more elsewhere in Europe. The Ferré Jeans line for women was also introduced in 1997, along with the formation of the Gianfranco Ferré USA to oversee the firm's increasing interests in America. Additionally, Ferré signed an agreement with Japanese conglomerate Mitzuno to open over a dozen shops in Japan, and to segue into producing golf apparel and equipment. In 1998 the Ferré empire celebrated its 20th anniversary, considered going public, and tweaked its image. Stores in New York and Rome were renovated, two London shops opened, a new Milan headquarters was unveiled, and offices and showroom for its recently-created U.S. subsidiary opened on Fifth Avenue in New York. Yet the year proved far from jubilant when Ferré's longtime partner Franco Mattioli decided to retire and sell his 49-percent stake in the company. The news caused a contentious rift between the partners, and in 1999 Mattioli sold 21-percent of his holdings to Gruppo Tonino Perna (GTP), corporate parent of the IT Holding fashion group. Gianfranco Ferré, after much negotiation, finally decided to sell all but 10-percent of the company bearing his name. Under the December 2000 agreement, GTP received 90-percent of the firm, and Ferré not only maintained creative control, but gained an atelier in Milan and a new couture line set to debut in 2002. The couture collection was a natural extension for Ferré, who had begun creating custom-made suits for a limited number of clients earlier in the year. Like Ferré a few years before them, the executives of GTP announced plans for an initial public offering scheduled for sometime in 2003. Gianfranco Ferré is easily identifiable as an Italian designer; his clothes are well-shaped, confident, and powerfully feminine or masculine. Through his own label collections, he has developed such hallmarks as the crisp white shirt with stand-up collar or in his signature color, red. The Ferré product, whether it be prêt-á-porter or leather goods, glasses, furs, or shoes, has become synonymous with precision and elegance, an identity which he believes has greatly increased the cachet of "made in Italy." this article is really informative, bt u hav'nt mentioned the marketing aspects( target market, brand identity ,competitors etc). this site is good but i cant seem to find any information on the african influences that gianfranco ferre has and uses in his designs is there any where i can find this information?